Spherical Plain Bearing GEGZ.ES 2RS Series not only has obvious advantages in material, but also has stricter control on precision in process and precision than ordinary bearings. In the course of work, it works stably, with low noise, corrosion resistance and wide application. Spherical Plain Bearing GEGZ.ES 2RS Series is resistant to rust and has strong corrosion resistance. It can be washed without re-applying lubricant to prevent rust. It does not require oil or grease to protect against corrosion. Therefore, if the speed and load are low, no lubrication is required. Spherical Plain Bearing GEGZ.ES 2RS Series installation and disassembly methods should be based on the structure and size of the joint bearing and the fit of the joint bearing components. 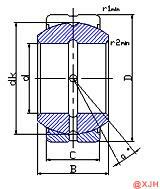 The pressure of installation and disassembly should be directly applied to the end face of the tightly fitting gear ring. The pressure cannot be transmitted through the rolling element, because it will cause indentation on the working surface of the joint bearing, affecting the normal operation of the joint bearing and even damage the joint bearing. Spherical Plain Bearing GEGZ.ES 2RS Series cages, seals, dust caps and other parts are easily deformed, and the pressure to install or remove the joint bearings cannot be added to these parts.